Great acrobatic shows are as much about the personality of the individual performer as the quality of the tricks. After all, if I wanted to see technically precise gymnastic routines I'd just pop along to a sports competition. 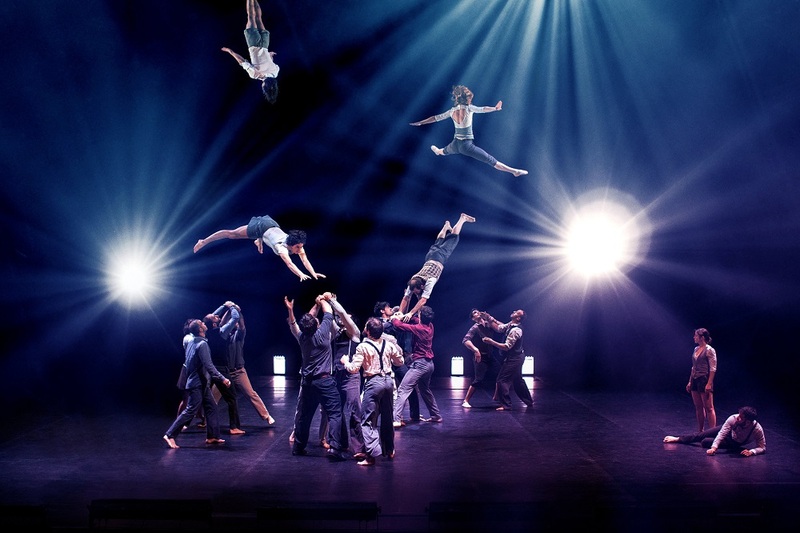 But French circus collective Compagnie XY's personality isn't focused on an individual performer hogging the spotlight but on the personality of the company as a whole. Their latest show, It's Not Yet Midnight, is a classily minimalist demonstration of the group's skills and guiding philosophy. Whether they're writhing around one another like a centipede-limbed gestalt or spiralling through the air in defiance of Isaac Newton, it's genuinely thrilling. 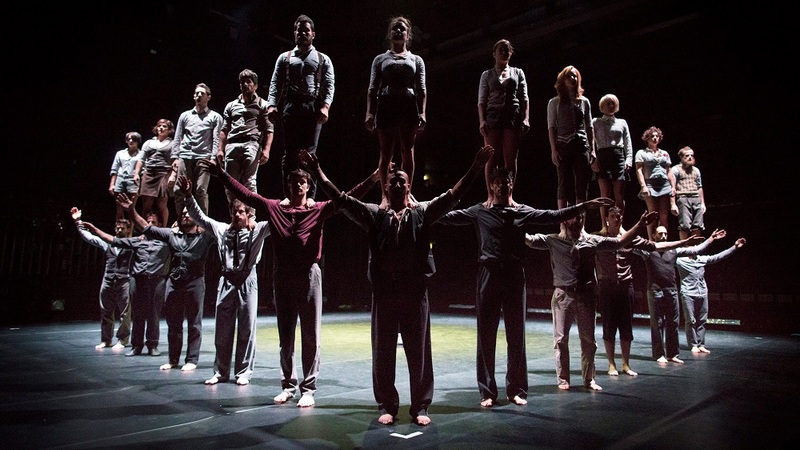 How can your jaw not drop when you see people stacked four high on top of one another: if they were to fall their only crash mat is the waiting arms of a fellow performer or the hard stage floor. Despite this, it's easy to get blase about acrobatic shows. Yes, it takes years of pain, sweat and dedication to be able to do this stuff and yes, it's intrinsically exhilarating to see the human body flying through the air. But let's face it, if you've seen one person doing a handstand on someone's head you've pretty much seen them all. This is where circus shows can founder: the audience will probably be familiar with the impressive feats, and showing them something new requires elite levels of skill and heightens the danger to the performers (if your star acrobat is nursing a broken leg it kinda puts the kibosh on a tour). What smart companies do is layer the tumbling and tricks on top of a firm intellectual skeleton - giving us a bit of context. And this is precisely what Compagnie XY do - giving us a physical argument of the merits of cooperation and trust vs paranoid individualism. Which is why we open with a mass brawl. One performer strolls onto the stage looking pleased with himself, before being roughly tackled and tossed across the stage. He lands with a thump, gets up and launches himself at his assailant. Soon the room is full of tussling performers, all beating the crap out of one another. It's an eye-opening start and a fine contrast to an evening in which life and limb hinges on trust. Would you hurl yourself backwards from a second story building on the promise that someone will catch you? It's Not Yet Midnight stacks people on top of one another like they're pieces in some gigantic Lego set, coming up with all kinds of unlikely configurations, or using the performers as counterweights to launch backflipping people high into the air from a seesaw, or as the legs of a multi-tiered human wedding cake. This combination of strength and grace impresses even the most sourpuss cynic - the audience audibly gasping and breaking into spontaneous applause throughout. There's a few mistakes here and there (at one point someone painfully thwacks into the floor), but the flaws only underline the point that these people or not so different from you or I. This is helped by them all wearing muted smart casual - if you saw them on the street you'd probably think they were refugees from a GAP photoshoot rather than high-octane circus performers. That these normal looking people can execute such jaw-dropped acrobatic manoeuvres only amplifies the message - we are stronger together than we are alone. Maybe the only fly in the ointment is a slight sense of twee-ness that pervades the latter half of the show - men with lumberjack beards, suspenders and ties energetically lindy-hopping teeters right on the edge of hipster self-parody. But quibbles aside, this is a powerful, effective and concise show that's pretty much guaranteed to please. It's Not Yet Midnight gives us acrobatics where the brain is at least as important as the bicep. It's Not Yet Midnight is at the Roundhouse until 23 April.